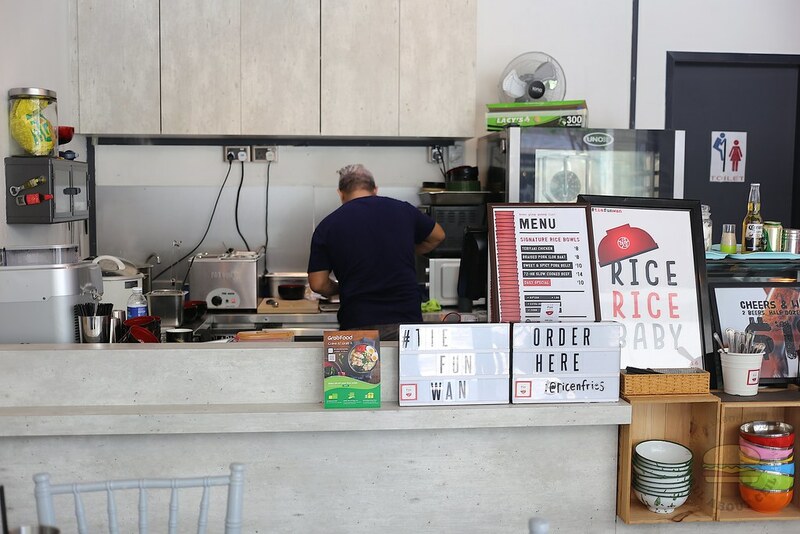 Chef Ken Chia, 43, the owner, previously manned Rice & Fries, a cafe along Changi Road for about 5 years before moving to the current location. 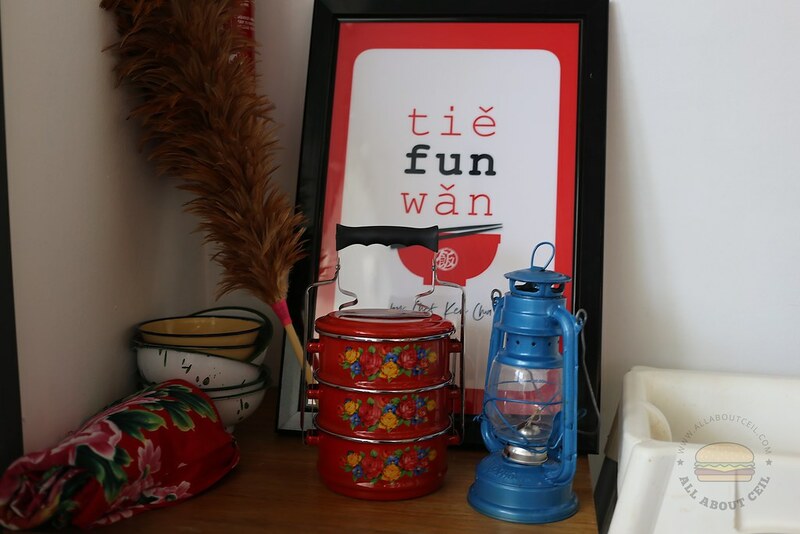 It is a hole-in-the-wall just a stone's throw away from Farrer Park MRT and is only selling rice bowls thus he named the shop as "Tie Fun Wan", it is 铁饭碗 in Chinese, literally means iron rice bowls. 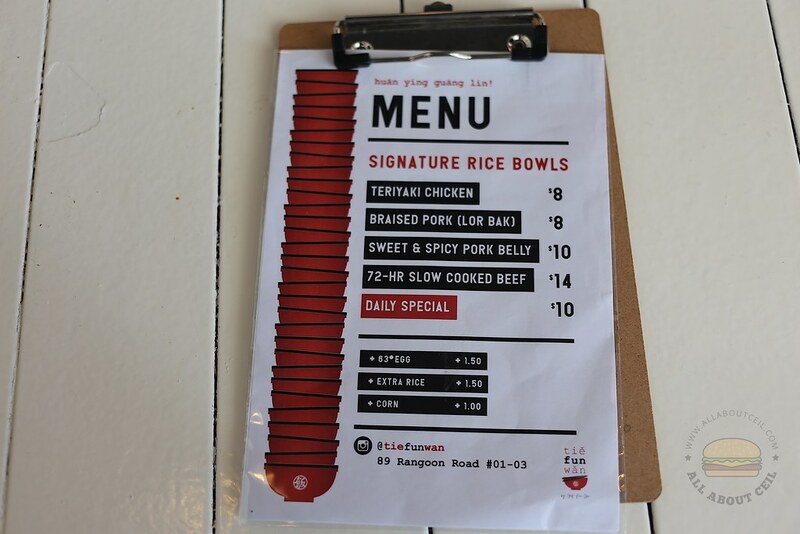 The menu consists of 4 different types of rice bowls including their signature 72-Hr Slow Cooked Beef ($14), Sweet & Spicy Pork Pork Belly ($10), Braised Pork (Lor Bak) ($8) and Teriyaki Chicken ($8), it served with the pearl rice of Shanghai noodle. There are choices to add a 63-degree egg for $1.50, corn at $1.00 and extra rice at $1.50. There were just another 3 customers when we were there for lunch on a weekday. Chef Ken was there all by himself. 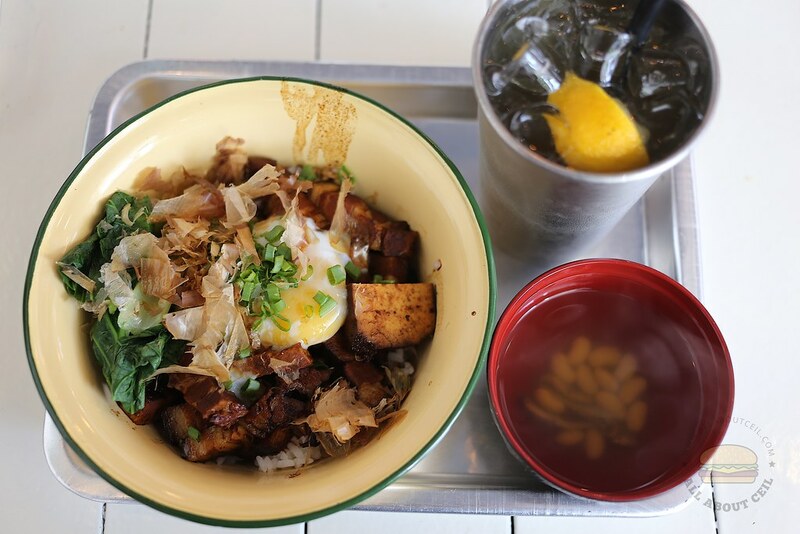 We ordered at the counter and decided to go with the 72-Hr Slow Cooked Beef bowl and Braised Pork bowl, added egg to both rice bowls. We were asked to take a seat. There are pickled radish and carrots in the containers available for self-service on the table. 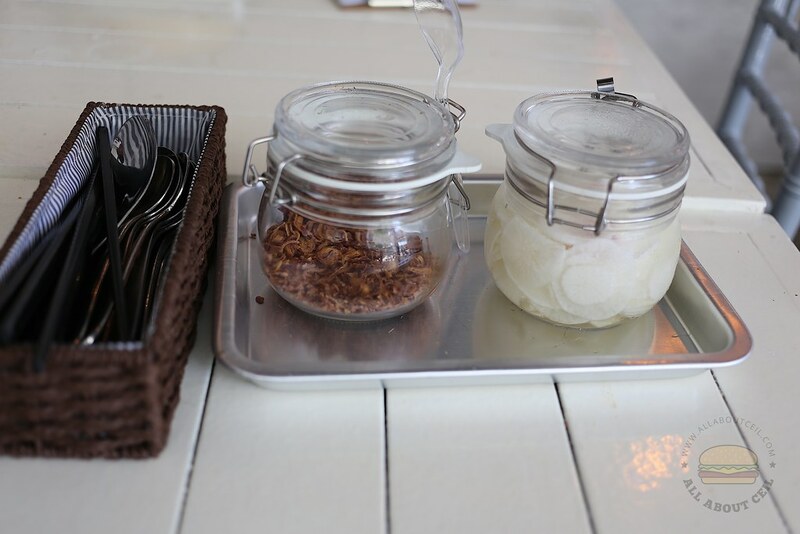 Chef Ken said, "These condiments go well with the rice bowls." He also said, "Everything is made fresh in house and no MSG is added." 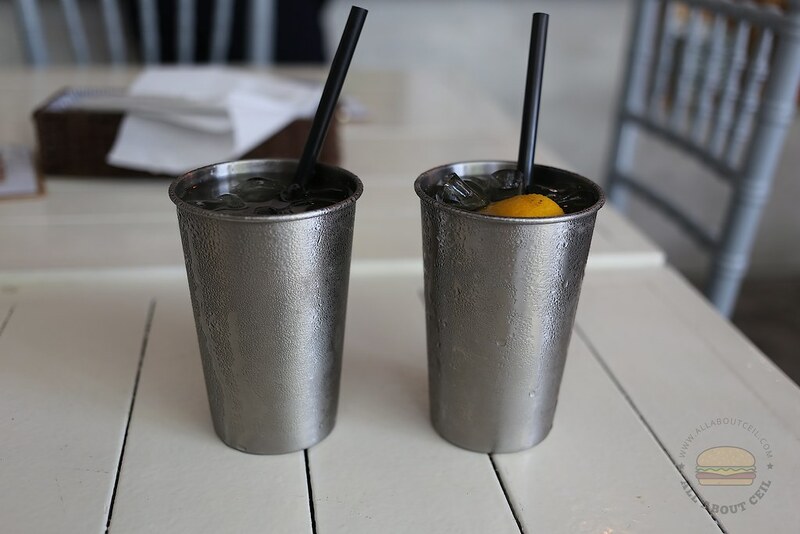 We also ordered the home-brewed drinks, Lemon Grass ($3.00) and Honey Lemon ($3.00). The Honey Lemon drink is particularly good for such hot weather. 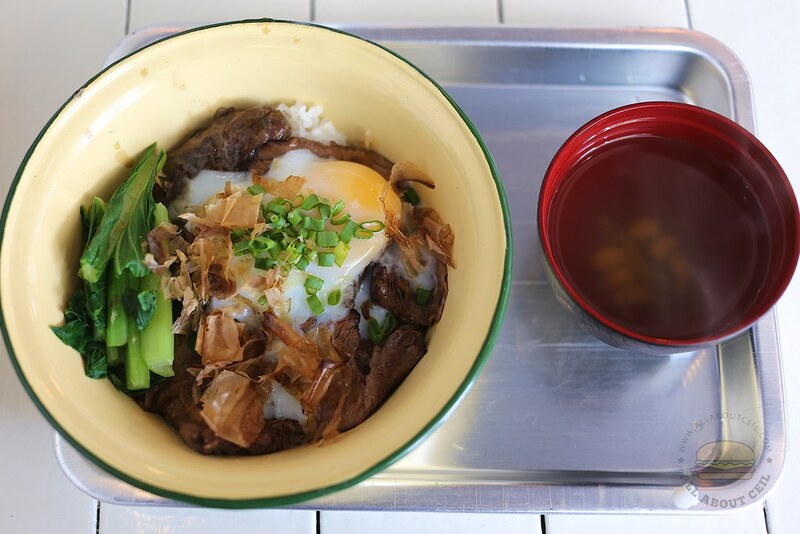 The 72-Hr Slow Cooked Beef bowl consists of lightly torched beef slices served with the housemade teriyaki plum sauce together with the 63-degree egg and greens, garnished with bonito flakes and chopped spring onions. The tenderness of the sous-vide Australian Angus beef has left an impression. My dining companion said, "It is really soft and quite flavorful." 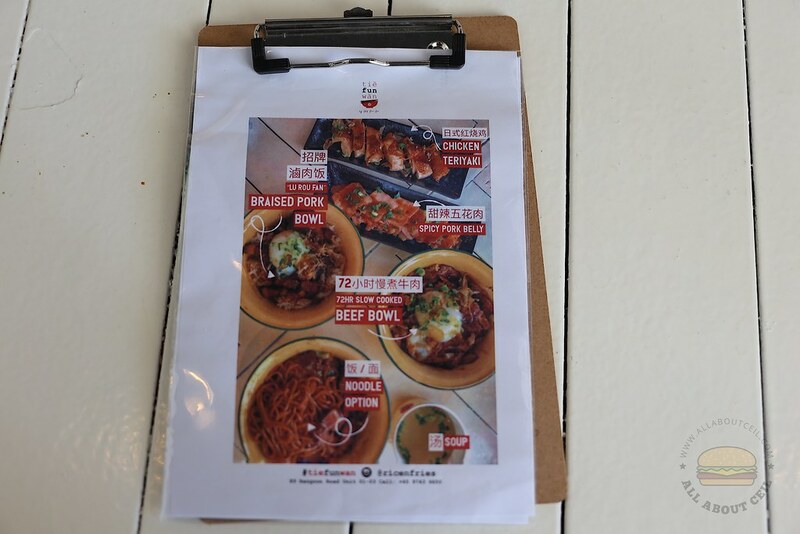 He added, "The soup that came with the rice bowl is actually quite tasteless though there are ikan belis and soya beans at the bottom of the soup bowl." The Braised Pork bowl came with a few chunks of braised pork and a piece of braised beancurd, garnished with bonito flakes and chopped spring onions. My dining companion said, "It would be nicer if the meat is softer." Chef Ken came over to ask, "How was the food?" I replied, "The 72-Hr Slow Cooked Beef bowl is very nice. My sister is quite a fan of your Western food particularly the Lamb Shank and Oxtail Stew." He said, "We are not able to do that here as cannot do heavy cooking right here." He added, "Another reason that we decided to move here is it was kind of quiet at our previous location. Sometimes, there were only a few tables." He is happy with the current location as his customer base is slowly building up. Sidetrack a bit. TPY Lor 8 FC will close from 21nd this month till Jul. 22. Better go else wait 3 months.